1383 is one of fifty Park Royal carriages (1379-1428) assembled by CIÉ at Inchicore between 1955 and 1956. They were constructed from parts supplied by Park Royal Vehicles of London. The majority, including 1383, were built to suburban specification, forgoing on-board toilets for the sake of extra seats in the vestibules. Only the last nine were built as mainline vehicles which had did have toilets. Structurally, the carriages were quite different to other Irish carriages. They were constructed using aluminium, making them rather light weight. They are narrower at the ends than they are in the centre, which at 10'2" is the widest ever used on Irish rolling stock. This gives them a rather distinctive appearance. This also allowed for a generous 3+2 seating configuration on the inside. Heating was by steam supplied from the steam locomotive or steam generating guards van, lighting was electric. 1383 was fitted for working in the Radio Train. One early working for these carriages appears to have been the Westland Row to Dun Laoghaire pier service. An Irish Times reporter praised the introduction of such modern vehicles on the service compared to the old 'dog box' carriages which preceded them. They would have been used on Dublin area suburban duties, including the Howth branch of the former GNR(I) after CIÉ received some of that company's assets in 1958. In time they would go on to see use on nearly all routes on the CIÉ system. They would have been hauled by a variety of steam and diesel locos, from nineteenth century J15s to the 071 class GMs of 1976. They would of course been gradually cascaded off top link services by newer rolling stock; the type disappeared from Heuston workings in the mid-1980s. However, they could still be found on Connolly based workings and cross-country routes for a while longer. They were often used (sometimes mixed with Craven carriages) on Connolly based outer-suburban workings, indeed some suburban vehicles were retro-fitted with toilets to make them more suitable for such services. Even in the early 1990s they could be found on the Cork to Cobh line, the Ballina branch and local services out of Limerick. The last working for these carriages was the Limerick to Rosslare route, the last three vehicles being withdrawn in May 1994. 1383 was acquired by the Society for preservation in 1994. Sister vehicle 1419 had been purchased the preceding year. 1416 was also preserved by the Society but unfortunately was the victim of an arson attack in 2004. With a seating capacity of 70, she was ideal for our trains - a family of six could be easily accommodated in one bay! A toilet was fitted to improve passenger facilities. 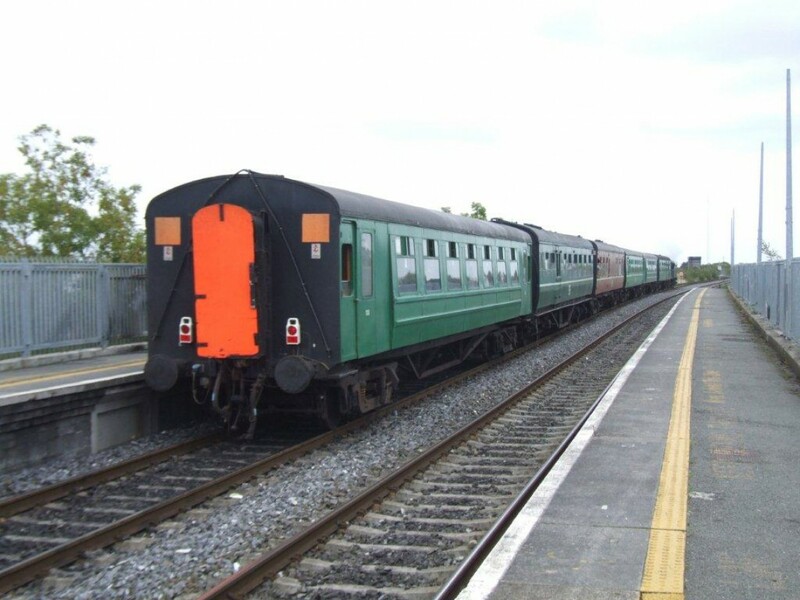 After a few years operating on our Dublin Area trains, she was sent to Mullingar for refurbishment in October 1998 and returned to Dublin on the Good Friday trip on 21/04/2000. A shop was fitted which proved a useful source of extra revenue on our trips. She served our Dublin Area operations well over the next ten years, and was fitted with a sluice room (for cleaning mops, buckets, etc.) in 2009. She operated up to, and including, the 2010 "Santa Special" season and since then has been stored out of use at Inchicore. Hopefully she will one day run again, if volunteer resources and suitable accommodation can be found to work on her.